Lake George Association (LGA) reports two additional sites infested with Asian clam have been discovered on the west side of Lake George near Bolton — one at Norowal Marina, found by Darrin Fresh Water Institute scientists, and the other at Treasure Cove, found by the LGA staff. These infestations appear to be significantly smaller than the nearly six-acre site at the village. LGA states that they urgently need to raise additional funds to fight this threat. Even with over $500,000 raised to combat the infestation in the village, the task force has serious concerns about how to finance the September removal of the mats and the rebar, as well as additional matting and suction harvesting that may be necessary. Current costs to monitor and manage the mats already in place are running $5,000 per week. 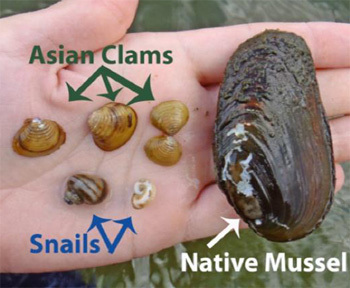 For more updates on the Asian clam and LGA’s eradication efforts, visit the STOP the ASIAN CLAM website.